We’ve talked a lot about beauty subscriptions and blind boxes in the past, but today I am introducing a new monthly service that caters specifically to the accessory fiends. 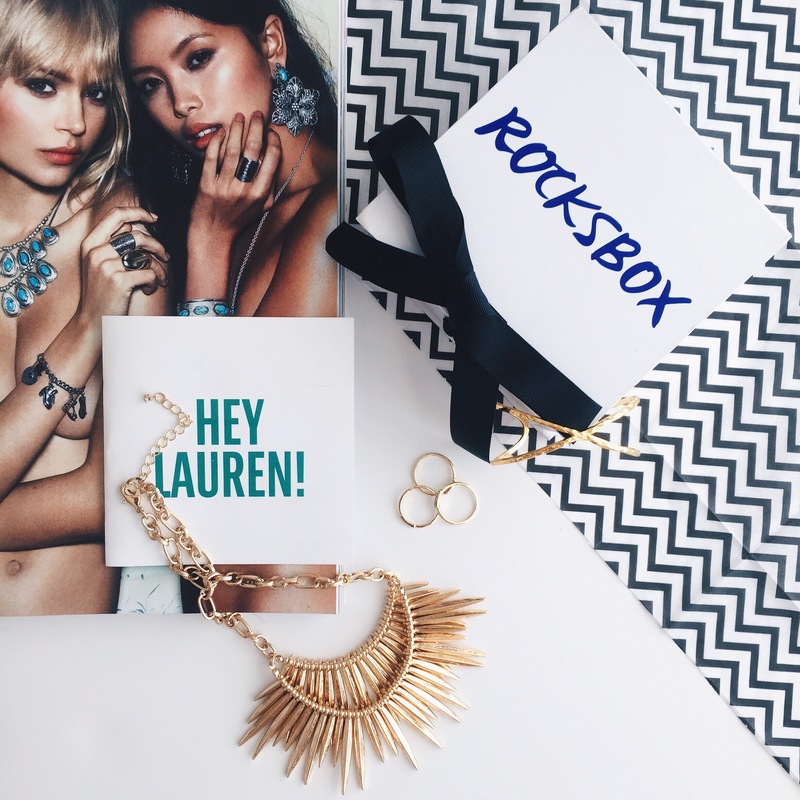 Rocksbox is a monthly subscription service that loans you a set of premium jewelry every month based on your own personal style. You can send your boxes back as frequently as you would like for a different set to wear, or if you decide you love a piece you can purchase it at a huge members discount. Whether your style is bold, elegant, or boho the Rocksbox stylists will have something for you. You can even select items from the website for your Wishlist to let the stylists know what you have in mind. I wanted to start off safe with some simple, all gold pieces. I made a note that I love stackable jewelry and the stylists really did keep that in mind when curating my box. Maybe next time I’ll push myself out of my comfort zone with a colorful, statement necklace… That’s what I like so much about Rocksbox; you can test out new styles for a few weeks to really decide how you feel about them. As an ‘RB It Girl,’ Rocksbox has given me the opportunity to share the shine with you. Head to http://rocksbox.com/ to sign up, then enter your special code ” ellekaexoxo ” for one free month. You can cancel at any time and there are no strings attached to your 1 month trial. If you do sign up, let me know what pieces you receive! Oh, I started my Rocksbox subscription last month and totally love having jewelry to try out. They really are good to curating to your style! I’ve been seeing a lot of this Rockbox everywhere lately. And with this special code it looks like I might have to check it out! Thanks for sharing. This reminds me of birch box! Love this concept and I definitely have to check out the site. Thanks for this! Could definitely use this one month trial! haha! Reblogged this on Fashion Trends & Lifestyle.